Friday May 13th 1892 It rained all day long. We got ironing done and worked at the quilt all our spare time. I have cold and do not feel very well. I wrote to Charlie. Saturday May 14th 1892 We were busy all forenoon with doing baking and the regular work. We had not our dinner work done when Hattie and Fanny came over to tell us Aunty Walker was dead. It was great shock to us as we did not know she was sick. Father was there yesterday. Mother and I went back with the girls and was at Esthers awhile. I received rent money from Dwight today and finished paying my note at the bank. Sunday May 15th 1892 I was busy about the house all morning the boys were so fearfully late getting around. After dinner Will and I walked over to Chalfonts and on down to Katties. We found Fanny not at all well. John & Hatt with Robbie were over here. I wrote a letter in the evening. Monday May 16th 1892 I was busy about the work all forenoon. We did not wash. Father & Mother went to town in the forenoon. Soon after dinner Will and I walked over to Esthers to attend Aunty Walkers funeral. She looked so natural and nice. I could not realize she was dead. Mr Barrett conducted the services. We will miss Aunty very much. We stopped at Hatties when we came back and walked on home. I had the headache. 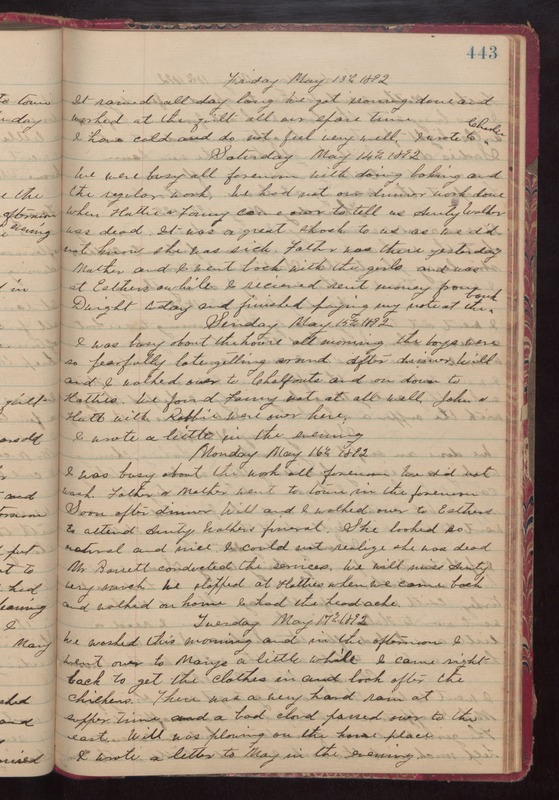 Tuesday May 17th 1892 We washed this morning and in the afternoon I went over to Marys a little while. I came right back to get the clothes in and look after the chickens. There was a very hard rain at supper time and a bad cloud passed over to the east. Will was plowing on the home place. I wrote a letter to May in the evening.